Aerotel Muscat Make your day hotel stay enjoyable and comfortable by booking your day stay at Aerotel Muscat. We are sorry but there are no available rooms for April 23, 2019. Rightly named the ‘Aerotel’, this airport transit hotel offers comfort and convenience at its best. 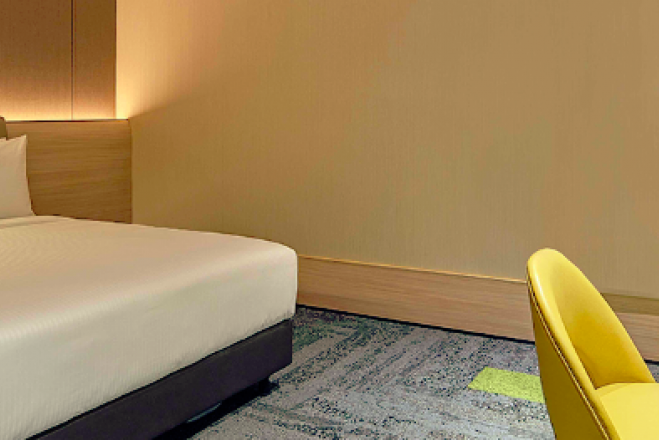 Whether you wish to relax for a few hours before your next flight or simply look forward to explore the city, the day use hotel can make it all happen. Ideal for both leisure and business trip, Aerotel Muscat ensures warm hospitality towards its guests. With a flexible option of booking hotel room for few hours, you can travel in style and comfort. Located at level 5 within departures of the Muscat International airport, the hourly hotel is truly convenient for travelers and visitors. Each of their rooms are well equipped with basic amenities to get you going. With private bathroom offering shower, towels and hairdryer, coffee/tea maker, work desk, free Wi-Fi, wake up service and comfortable beds, there is nothing to worry about. Spend a relaxing daycation before traveling far and wide, it can be your perfect timely accommodation partner. The hotel also offers safety deposit box, ATM, gift shop, mini-convenience store, daily housekeeping and 24 hour front desk. While airport location is the best highlight of the hotel, you can also explore some local attractions in the neighborhood. The Onam capital city offers diverse options of cuisines, parks, recreation centers and entertainment hubs for the entire family. Fill your bags at the Muscat shopping center before relaxing on the nearby shore. Visit the As Sawah public garden in the vicinity. Perfect for a quick stop-over before continuing the journey or a relaxed time away from home, Aerotel Muscat is a good idea for an enjoyable day stay. Muscat City Center — Located at short distance from the hotel, Muscat city center is a good shopping destination for all. It houses numerous brands of clothing, fashion, electronic, groceries, home goods to name a few. There are many dining options with variety of restaurants and food joints. It also offers a fun entertainment center with video games, rides and interactive displays. Museum of Illusions — A unique attraction in the area, Museum of illusions is few minutes from the hotel. It houses various exhibits, displays, designs and experiences that are totally different and unbelievable. Test your ideas and senses at this novel center that challenges with illusions. Natural History Museum — Another attraction next to the museum of illusions, this spot focuses on natural history, exhibits, information and displays since several years in the past. It houses collection of Onam’s flora and fauna such as fossils, marine animals, mammals, birds along with a botanic garden. It also offers information about planets, solar system, and space besides historical exhibits. Smoking is strictly prohibited in the rooms and hotel premises. Hotel is located inside the airport, so have passport and boarding pass for check-in.